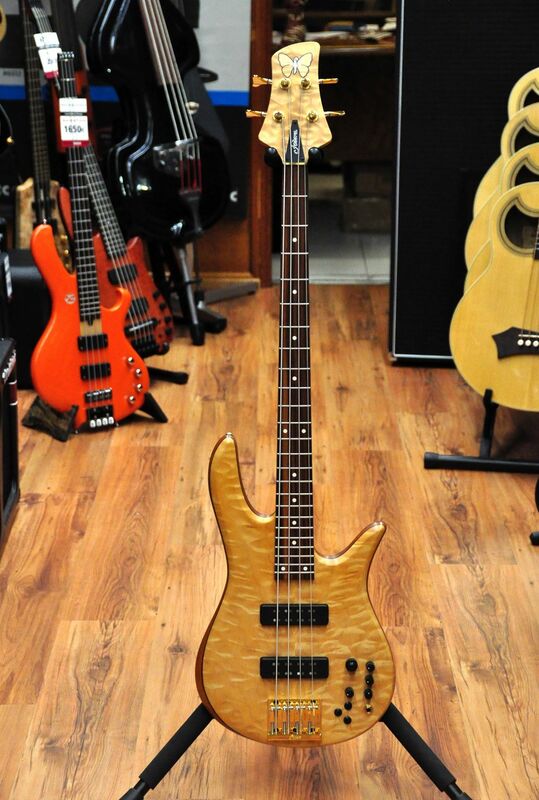 It is alway party time when we get a new Fodera bass at the shop, but this one is really exceptional. This year 2018 marks the 35th anniversary of this family run business called Fodera that was started by Vinnie Fodera and Joey Lauricella in a small shop in Brooklyn, NYC. Back in 1983 these two artisans and musicians started this company with the only goal of producing the absolutely best basses that a man can make. Have they succeeded? You bet!! 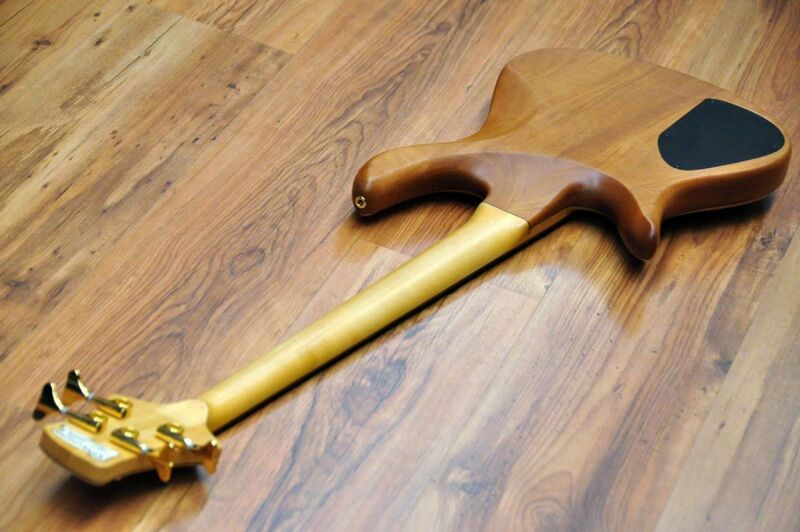 35 years after those initial stages, Fodera has become THE name when it comes ti high end handbuilt bassguitars. 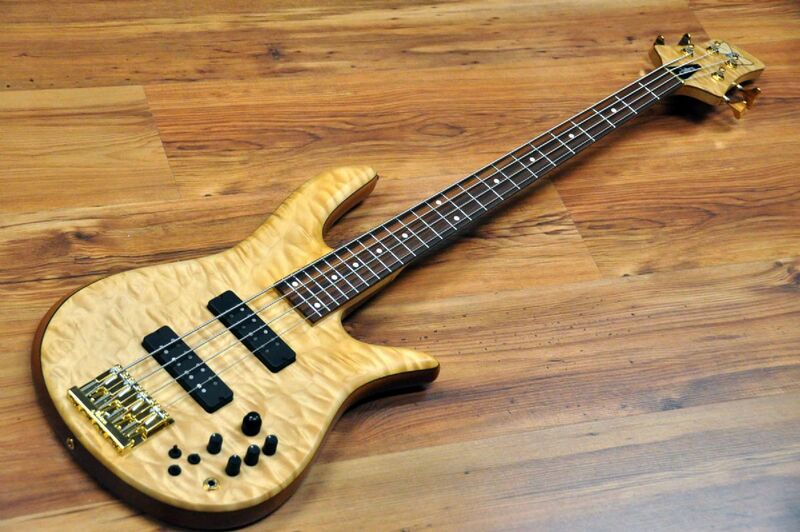 Fodera basses are what the rest are compared to, simple as that. We really believe they make the best instruments in the world and we are honoured to be part of the family as part of their worldwide distributors. Not only do they make amazing instruments. In the not so long period of 35 years they have developed an impressive number of different models, each one of them with their unique personality. Each of these models are completely different to each other but quality remains the same through the whole range. This is the Fodera Monarch 35th Anniversary Bass and it is obviously based on one of their first designs (and still one of the most used and accepted): The Monarch. This model was the one that Victor Wooten got back in 1983 (with EMG PJ pickups in that case) and the one he used to develop his amazing technique since then. This particular model resembles that original model in aspects such as lightweight mahogany body, 3 piece maple neck, large headstock with large wooden butterfly inlay, bronce nut, quilted maple top, etc. Of course it features the latest Fodera bridge and Mike Pope electronics for unparalleled performance. Pickups are a set of Custom Duncan Humbuckers that can be split and sound absolutely perfect in both modes. This bass sounds amazing in passive, and the Tone control is really musical and can tame down the high end as well as bringing some extra midrange when it is completely cut (we love doing that with the bridge pickup soloed). The preamp is Mike Pope's 3 band board and it is musical and noisefree. Use it to add more punch or cut/boost selected frequencies (you get the choice of 400/800Hz for the midrange). The Tone pot can be used in Active mode too. The amount of sounds on tap is just amazing and the good news is that all of them sound amazing. We just cannot think of a particular technique or musical style where this bass won't shine. This bass just kills. Every note sounds fuller than we are used too. It is as if the harmonic content of each note is more present here than in many other basses. Notes just ring and sustain better. Of course this would mean nothing if the bass could not be played comfortable but there are no surprises here: this bass can be set for ridiculous low action if desired with no fretbuzz. This is one of those basses that simply begs you to play it. The more you play it, the more it gives back to you. Also techniques that are hard in other basses are easy as pie here. This is not caused by a single factor but by the sum of them all. All you need to do is test it for 30 seconds and you will know what we are talking about. The fact that it is an Anniversary model also means that this bass will hold its value in the future. It comes with the best case we've ever seen, straplocks, tools, manual and certificate. By the way: this is the second Monarch 35th Anniversary bass that we've ordered and it is the last one too as Fodera only built a limited number of these. Production is now closed so this is your last and only chance to get this bass. First come, first served.